The Secretary of State for Scotland was asked about approved and refused proposals for Old Persons Homes since 1976. His reply notes that a home in Ballachulish has been provisionally included in the programme for 1971/2, but that a review was due to start. Lord Burton stated that he was grateful for the approval of the Ballachulish Bridge, but in his opinion a bridge to Skye would have been a better proposal. He also stated that teh county council of Inverness had recently discussed working together with Argyll and Ross & Cromarty to draw up a joint transport plan for the whole West Highlands coast. In a debate about industrial development in the Highlands it was noted that the Highlands and Islands Development Board had been authorised to buy a site in Ballachulish for Industrial use. The Secretary of State for Scotland was asked when he hoped work to start on the bridge, and replied before the end of 1972. Although the actual date of works starting on site for the new bridge is currently unclear, photos taken in July 1973 clearly show that work is well underway on the foundations of the piers on both sides of the narrows. Cranes and piling machines can be seen on the north bank of the loch, preparing the ground. However, there is no evidence of work having progressed beyond ground level at this time. The cost of taking a car across the ferry in 1973 was between 30p and 45p depending on length. A pedestrian cost 2p, the same as a sheep, whilst cattle were 8-10p each! Although not absolutely confirmed, it appears that these prices remained in place through until the end of the ferry service. 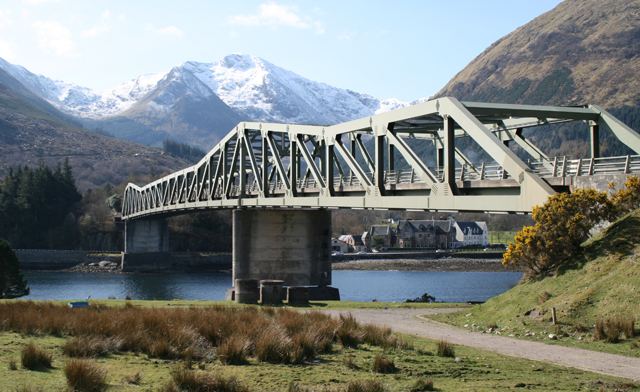 The Ballachulish Bridge was mentioned in a debate about major river crossings in Scotland. It was described as the first of a new wave, to include the Kessock and Cromarty Bridges, and that crossings of the Dornoch Firth, Kyle of Lochalsh and Kyles of Bute were also in discussion. The Secretary of State for Scotland was asked if he would take ‘urgent steps’ to redevelop Ballachulish. He said that they had consulted Argyll County Council and were trying to assess the amount and cost of work required to deal with the Slate Bings. The 1974 AA ‘Illustrated road book of Scotland’ quotes the population of Ballachulish as 1254, and North Ballachulish at 120. However, it also suggests that the slate quarries are still in operation, so may not be completely accurate. Although delayed a little by bad weather, the final road plate was installed on the bridge in early May, meaning that a vehicle could cross the bridge for the first time. Prior to this, workmen had crossed on planks balanced across the truss frame, although the first person across was local man Don Bennett. Scottish Local Authority Reform comes into place following the Local Government (Scotland) Act 1973, resulting in abolition of County Councils. The whole area on both banks of Loch Leven and so the under-construction bridge now come within the new Lochaber District Council and Highland Regional Council areas, although the Scottish Office are still responsible for the construction of the Bridge itself. Whilst the reorganisation of 1996 led to the demise of Lochaber District Council, its powers were transferred to the ‘new’ Highland Council, successor to the Highland Regional Council. In what could have been a catastrophe, the local area was shocked by a loud bang reputedly heard in Kinlochleven 8 or so miles away, which came from the bridge. It proved to be a bearing exploding on one of the bridge piers and was to delay the opening of the bridge whilst repairs and safety checks were made. The 1st October was to have been the official opening of the Ballachulish Bridge, but due to the fault with a bearing, the opening was delayed. The ferry company, however, were not to be moved and had already sold the three vessels, and started the process of liquidation. Fortunately, the Glenachulish had been sold to the new Highland Regional Council as a back-up vessel for Corran, amongst other crossings, and so with the lesser traffic of autumn, and by utilising crewmen from Corran they managed to continue a service across the narrows until the bridge was opened in December. The last sailing by the ferry company was marked by the firing of 3 rockets and a 25 gun salute. The ferry had employed 18men, but with just the Glenachulish left, the Highland Council operated the ferry with just two men until the bridge opened, taking the money on board. 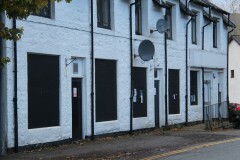 The Secretary of State for Scotland was asked about requests for Government Aid to redevelop Ballachulish. He replied that he had received none, but was expecting the New Lochaber District Council and Scottish Development Agency to start discussions soon. When the Secretary of State for Scotland was asked if he could say when the Ballachulish Bridge would open, he was unable to provide an answer. Just a month after entering liquidation, the ferry company is formerly wound up, 40 years after its formation. The company may have gone, but as noted above one of the ferries continued to ply its trade across the narrows from North to South Ballachulish and back again, namely the Glenachulish, the last and best of all of the company’s ferries. It was asked whether the bridge was open, and if not what the delay was. The reply was that completion had been delayed due to the failure of a bearing, and had had to be replaced. They were also checking the other bearings. The seriousness of the matter was played down, and whilst the bridge should have opened in October, the Lords were assured that the bridge would be open for Summer 1976. He was unable to comment on additional costs, although stated that the original estimate had been for around £2 million. He also assured the Lords that the Highland Council were maintaining the ferry service in the interim. Upon completion of the Ballachulish Bridge, the same team started construction, in 1976, of a near identical bridge across the River Tyne to carry the metro across from Newcastle to Gateshead. That bridge took 3 years to build and cost £4.9 million. With the opening of the bridge, there was no longer any need for a ferry service beneath it, and so the ferries ceased running. The last crossing took place at 12:01, as the bridge above was being opened. Some of the old ferries had interesting afterlifes, however. Of the last three ferries to serve on the Ballachulish Ferry crossing, Glenachulish (1969) is still in summer use on the Glenelg – Kylerhea Skye service, but neither Glen Loy (1964) nor Glen Duror (1961) saw any further service as ferries, and after being used as barges they were both laid up on local beaches. Of the older ferries, Glen Mallie (1959) is a hulk somewhere off the coast of Barra after initially operating on the Glenelg route before serving as a cattle transporter from Barra and Vatersay to Skye. The Maid of Glencoe had been broken up in 1971 due to the high cost of her repair, after several years serving the Isle of Scalpay in the Western Isles, having been renamed ‘Scalpay’. Mamore (1951) was transferred to Kylesku in 1959 and served there until retirement in 1967. The Queen of Glenalbyn also served at Glenelg, whilst the Maid of Glencoe was sunk in December 1955 off the shore somewhere to the west of the southern slipway. In 1976 the Episcopal Church merged the churches in Glencoe and Ballachulish for a single incumbent, and as a result they had a spare Rectory. 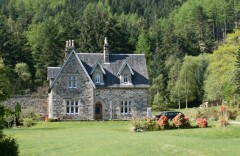 St Marys in Glencoe was retained, and St Johns Rectory sold. It has since operated as a guest house but is now a private home. Although the date of removal is not certain, some of the moorings which caused so much debate in Westminster a decade earlier have been removed, as it was reported on 25/4/77 that the chains had not been lifted and were an obstruction on the loch bed! 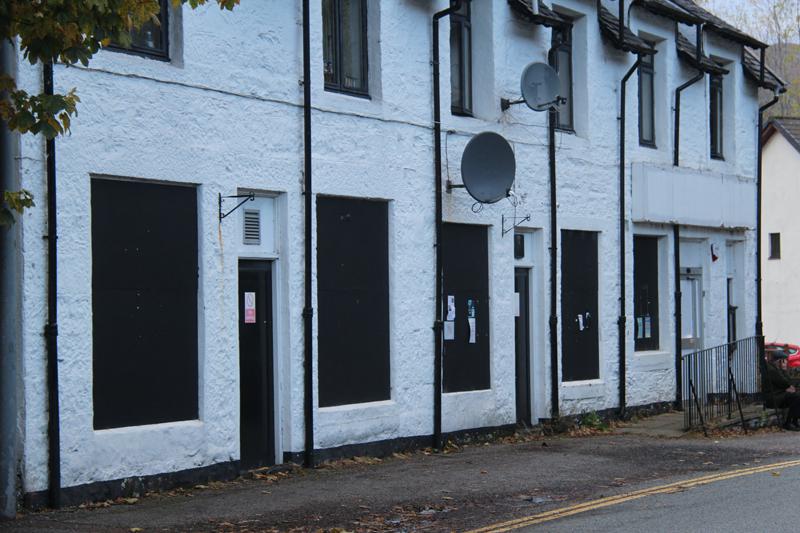 The Scottish Development Agency arrived in Ballachulish in the Summer of 1978 for the start of a 3 year clean-up operation to improve the look of the village. It is possible that without the campaigning of local lady Jessie MacInnes(?) the work may not have started yet. The next 9 months were spent moving slate with bulldozers, diggers and tippers some of which were driven by local people. After that the ‘soft’ landscaping started, with 40,000 tonnes of topsoil, three quarters of it taken from the site, used to cover the slate before the trees and bushes were planted. In total some 80,000 trees were planted around the village. Whilst the subsequent plans for a holiday park, marina, shops and restaurants were quietly turned down by the community who feared an Aviemore like development, the SDA still spent around £1 million on the project. After nearly a century in family ownership, Barrs Stores were sold by the Grants (descendants of the Barrs) in October 1978. The family had previously closed their branch in Kinlochleven in 1976, after around 70 years of being run by the family. There were further local improvements to the A82, with the new section past Tigh Phuirst being built, and including a bypass of the old slate arch, albeit with the demolition of the large arch. The road past St John’s Church was also widened, this section using parts of the old railway line to provide a better line for the new road. The Tigh Phuirst section disturbed what was believed to be the grave of a local witch, and there were a number of landslides of slate waste onto the new road near where the grave had been, before the Gabion Baskets were installed to solve the problem.